Alexander Forbes was born in St. Nicholas, Aberdeen, Scotland on February 17, 1860 and was the oldest of 8 children. He attended the University of Aberdeen, at which time he decided to become a foreign missionary. He originally hoped to serve in Africa, but went to Western Canada instead. He also studied at King’s College, Aberdeen, and the Free Church College. While studying at King’s College, Alexander taught singing at the Sea Bank House for fallen women, where Agnes Sorrel worked. In 1891, Agnes and Alexander became engaged. In 1894, Alexander immigrated to Canada, landing in Nova Scotia. Although his listed destination was Winnipeg, he was soon sent to Edmonton. Agnes followed in 1895, arriving in Montreal and journeying to Edmonton, where they were married by Dr. D. G. McQueen. Reverend and Mrs. Forbes did missionary work in Fort Saskatchewan for fifteen years. They came to the Peace country in 1909 to survey the feasibility of sending a missionary to the area and in 1910, in the absence of any other volunteers, decided to come themselves, serving as missionaries to the Peace River district and Grande Prairie in particular. The Forbes travelled by caboose over the Long Trail to reach Grande Prairie, a winter journey that took them 73 days. In their travelling party were members of the Argonaut Company, which was the development company responsible for laying out the Grande Prairie townsite. The Forbes first lived in shack provided by the Cliffords on their homestead at Flyingshot Lake. This building and the Forbes’ caboose also served as a pioneer hospital. Grande Prairie’s first Presbyterian Church service was held at Mr. Smith’s shack in June 1910 with a congregation of seven. Services were also conducted at Bear Lake, Beaverlodge, and occasionally Spirit River. The first church building was erected in 1911 on the eastern banks of Bear Creek. There were Presbyterian churches later built at Spring Creek, Glen Leslie, and Bezanson. Services were also held at Clairmont, Sexsmith, Kleskun Lake, and occasionally Sturgeon Lake. In the fall of 1910, Alexander filed on a homestead bordered by today’s 100 Avenue, 100 Street, 108 Avenue, and 96 Street. The first building on the homestead was the pioneer hospital, built in 1911. The Forbes later built an adjoining home, Montrose House. This building is still on its original site on what is now 96 Street. In October of 1911, Alexander was elected trustee of the Grande Prairie School Board. Montrose School was later located on their land and named for Agnes’ home in Scotland. A new, larger hospital facility was constructed in 1914 to replace the Pioneer Hospital at the Forbes’ house. The Kathryn Prittie Hospital was located on the Forbes homestead near the railroad tracks. Agnes died in her sleep in August 1917 and is buried in the Grande Prairie Cemetery. Alexander carried on the work of the church after her death. He remarried in 1921 to Miss Christine Smith, a nurse. In 1925, the issue of church union between the Presbyterian, Methodist, and Congregational denominations was raised in the Grande Prairie congregation, as it was across the country. A meeting was called to decide whether or not the congregation would remain Presbyterian or become United. The vote for union passed, creating St. Paul’s United Church. 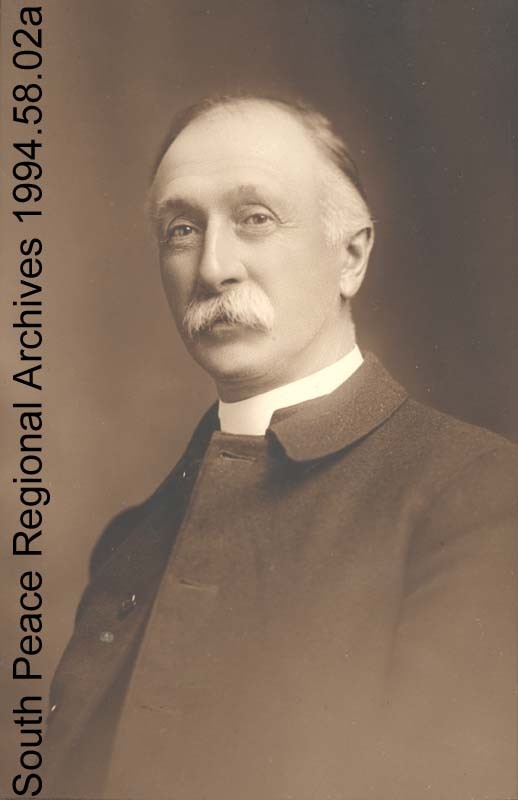 Reverend Forbes accepted a call to the Presbyterian church in Teeswater and Belmore, Ontario, where he served for the next seven years. His final church was in Sutton and Mount Pleasant. He retired in 1936 and lived in Toronto. After death of Christine in 1944, he moved to Paris, Ontario, where he died in 1945. You may view the Alexander and Agnes Forbes Finding Aid here. Sources: Grande Prairie: Capitol of the Peace, Pioneers of the Peace, Agnes Sorrel Forbes: A Pioneer Missionary to the Peace River District, Prepared to Care, Health Units of Alberta, Heritage of Service: The History of Nursing in Alberta, “Genealogy of Alexander Forbes”, “Dr. Forbes History Appendix B Alexander Forbes Homestead”, Grande Prairie Herald, Grande Prairie Herald Tribune, Grande Prairie Museum clippings files, Alexander and Agnes Forbes clippings file.